What breed is my dog? Her name is Abby and she is a little over a year old. I so wish this site offered the ability to see a larger version of the pic you added. The gold color could come from a yellow lab or a golden. The ears resemble the collie or shepherd. Adorable at any rate! Looks like she's got Golden Retriever in her, but may also have Collie & Yellow Lab. Cute! I think because of the long hair and build it looks like Irish Setter and lab. She looks like a comfort retriever. 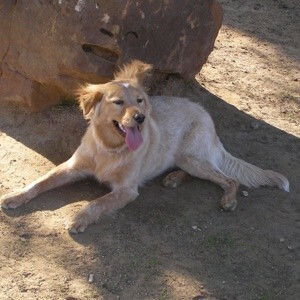 They are golden retrievers bred with spaniels so they are a bit smaller with softer features. Also could be a border collie/golden or ausie/golden mix.